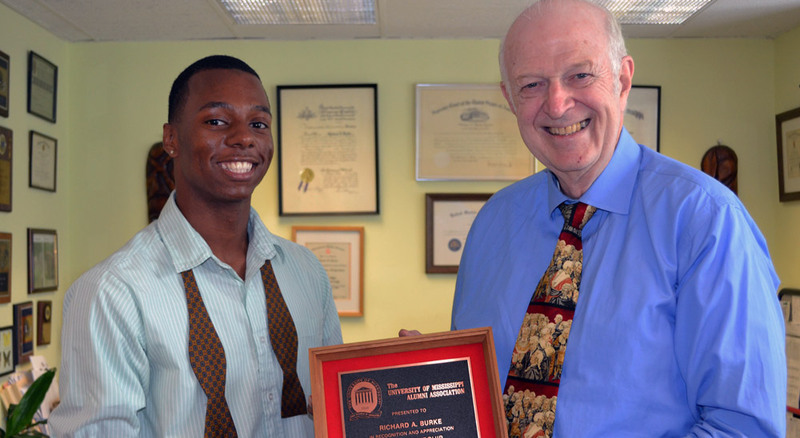 Photo: UM law student LaKeith Faulkner (left) spends time with Richard Burke in his New York law office, where Faulkner interned between his junior and senior undergraduate years. Faulkner credits his internship with Burke as a major factor in leading him to law school. Submitted photo. OXFORD, Miss.­­­ – Since his graduation from the University of Mississippi School of Law in 1966, Richard A. Burke has had a heart for helping others achieve the American dream, whether it's Ole Miss undergraduates searching out future career avenues or international students looking for professional futures in the United States. Recently, Burke was honored with the inaugural Outstanding Partner Award from the UM Internship Experience Program, reflecting his dedication to providing meaningful career experiences for numerous Ole Miss undergraduate students over the past 10 years. "He has been an amazing mentor for UM students and a continuous supporter of the opportunities this program provides," said Laura Antonow, director of the Internship Experience Program. "He was one of the first in the tri-state New York City area that was onboard for accepting undergraduate interns, and he has been actively involved with the program ever since." Second-year UM law student LaKeith Faulkner, of Holly Springs, worked as an intern in Burke's New York law office in the summer of 2012. His work there was an invaluable learning experience, he said. "My internship with Mr. Burke was the highlight of my undergraduate career," Faulkner said. "It helped me confirm that I was on the right path in my chosen profession. It was an honor to have the opportunity to learn from a truly respectable and kind person." Faulkner recalled that Burke's way of paying attention to his clients stood out to him during his time in the office. "The first thing he did was listen closely to each client," Faulkner said. "He wanted to understand their needs first and foremost. I saw how he worked to humanize and personalize each case." Burke graduated from City College of New York with his bachelor's degree in 1963. Having never actually set foot in the South before arriving in Oxford, he credits his father with encouraging him to apply to law school. Everything going on at the university during that time had piqued his curiosity, he said. "I guess you could say James Meredith and my desire to help people played a part in the allure of Ole Miss for me," Burke said. Being from a different part of the country, he felt a little out of place at Ole Miss but quickly made friends with international graduate students who had come to the school to complete advanced degrees. "I took to a group of students from India who became my lifelong friends," Burke said. "It was the happiest two-and-a-half years of my life. I met a number of great people." After he graduated from law school and returned to New York, some of his friends from Ole Miss contacted him to inquire about his knowledge of immigration laws. "There was no such thing as immigration law back then," Burke recalled. "My friends assumed that since I had graduated law school, I must be knowledgeable about those laws. Forty years later, the law firm of Burke, Burke and Burke consists of four attorneys and five legal assistants who have helped thousands of clients from all over the world obtain their permanent residence and United States citizenship. "I feel that my whole practice fell into place because of the people I met at Ole Miss," Burke said. "I have always felt a debt of gratitude to the university for my positive experiences there." An avid world traveler, Burke has journeyed to 216 countries, with the goal of visiting every country in the world. "There is no substitute for getting to know people from other cultures and different parts of the world," Burke said. "I like the idea that the students in my office learn how to work with a variety of people from all walks of life. "I think this kind of opens up their eyes to understand that there are all types of people in the world that may have different cultures than they are used to." One of the traits that makes an intern successful in his law office is curiosity; not necessarily about law, but about how you can be of assistance to people, Burke said. "Going that extra step for our clients is what we encourage," he said. "The students who do well in this internship are those who want to understand why we do things, or how to best provide for our clients." Being kind and disciplined is something Faulkner credits Burke with instilling in him during his internship. "He has such a genuine spirit and wanted me to feel accepted and valued as an intern in his office," Faulkner said. "He also helped me learn more about conducting myself in a business environment." 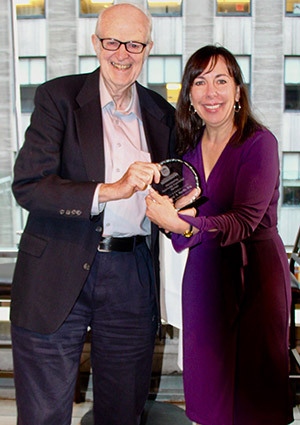 Antonow said that it was only fitting that Burke receive the Outstanding Partner Award at its inception. "He has shared so much knowledge and so many opportunities with Ole Miss students over the years," she said. "He cares about the students and that they have good experiences in his office. He wants them to learn how to be successful in a professional setting." For more information about the UM Internship Experience Program or – if you are an Ole Miss alumnus in Atlanta, New York City, or Washington, D.C. – for ways to support the program, visit http://www.outreach.olemiss.edu/internships/.